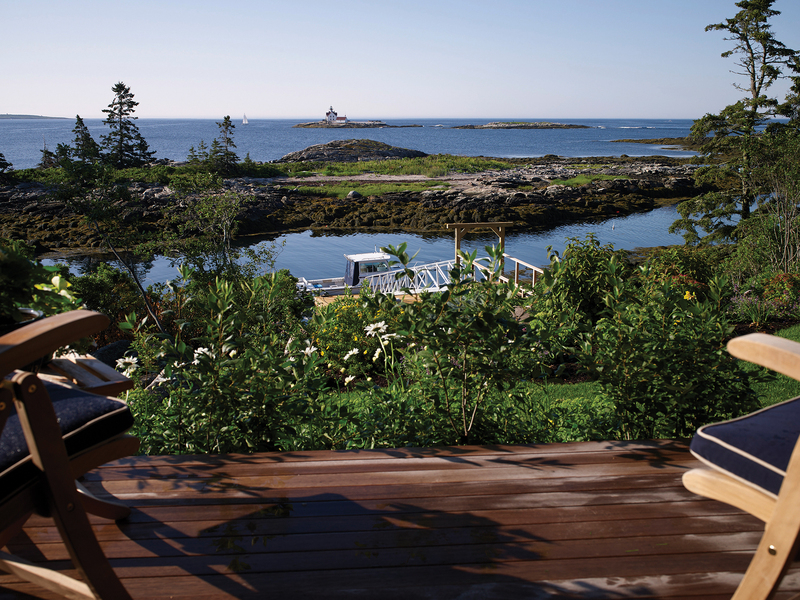 Town Landing is a series of coastal-styled buildings, including a main house, a guest cottage and a traditional barn, located on the rocky shoreline of Maine’s Southport Island. 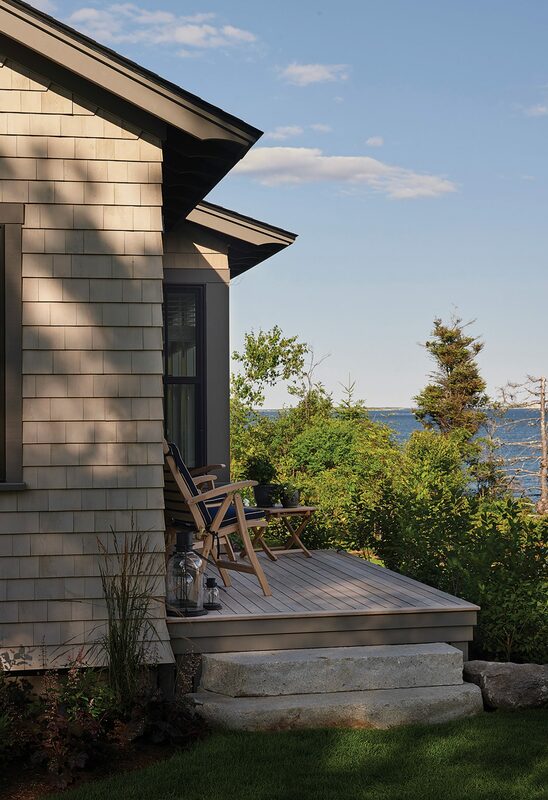 The property functions as the mainland base for transportation to and from the nearby Inn at Cuckolds Light, situated on an island a half mile offshore. 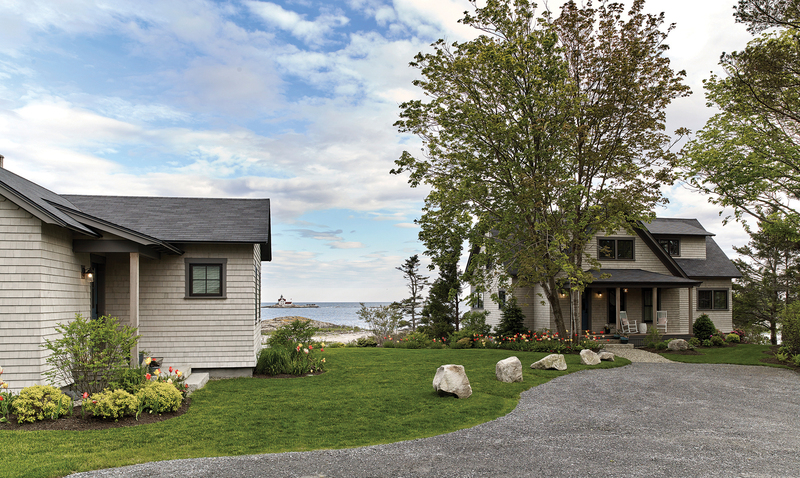 The main house at Town Landing combines the warmth and ease of Scandinavian design with an elevated coastal aesthetic drawn from its island surroundings. 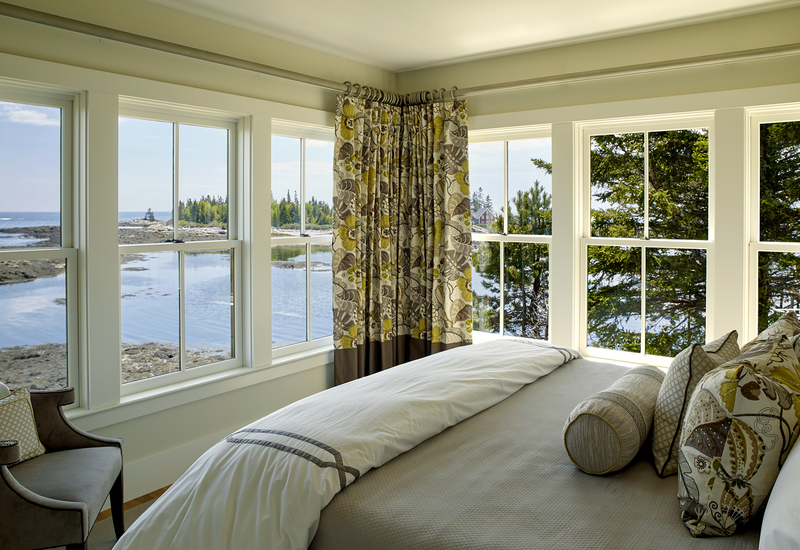 The use of pickled fir beams, timeless birch flooring, and custom steel metalwork results in a simple elegance that frames the stunning view. The solid surfaces within the home are a study of restraint in color. 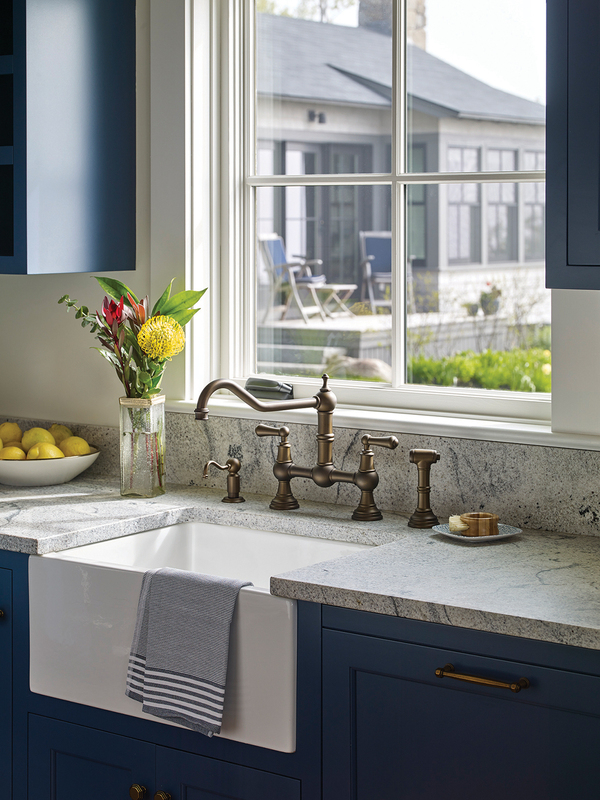 The uniform soft warm gray walls and the whites, blues, and wood tones of the cabinetry become the canvas for a juxtaposition with the textiles, which feature bright colors of citron, blue, and turquoise. The aesthetic integrity of the materials was maintained throughout the design, allowing their characteristic texture and beauty to shine through. Unaffected finishes include the concrete parging on the fireplace surround, the raw steelwork of the diamond-lattice wood box, and the natural brass of light fixtures. This intent was carried through to the furnishings and amenities, such as the hide of the stretched bar stool seats and the natural fiber content of the cotton, linen, and wool textiles. 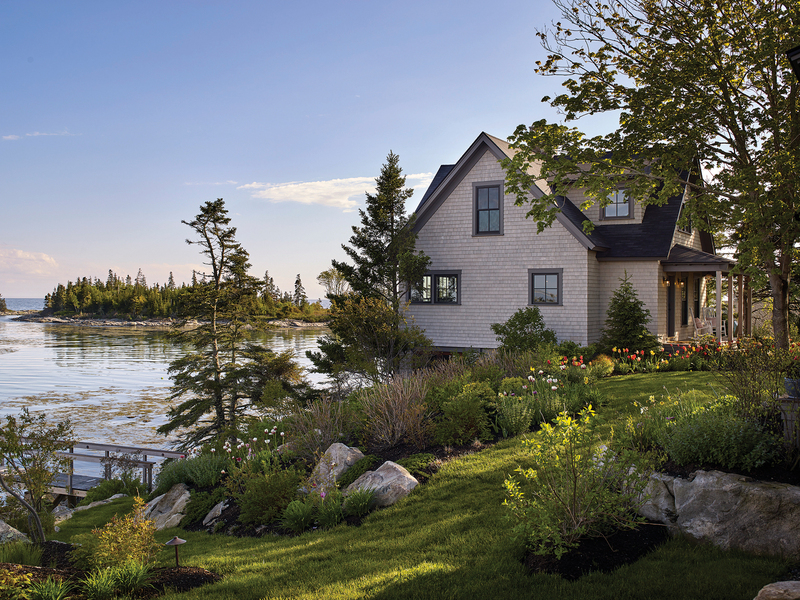 The main house replaced an existing, grandfathered cottage within the 75’ setback from the shoreline. As a result, the overall size and footprint of the home was very restricted and the creative use of space was key throughout the design process. 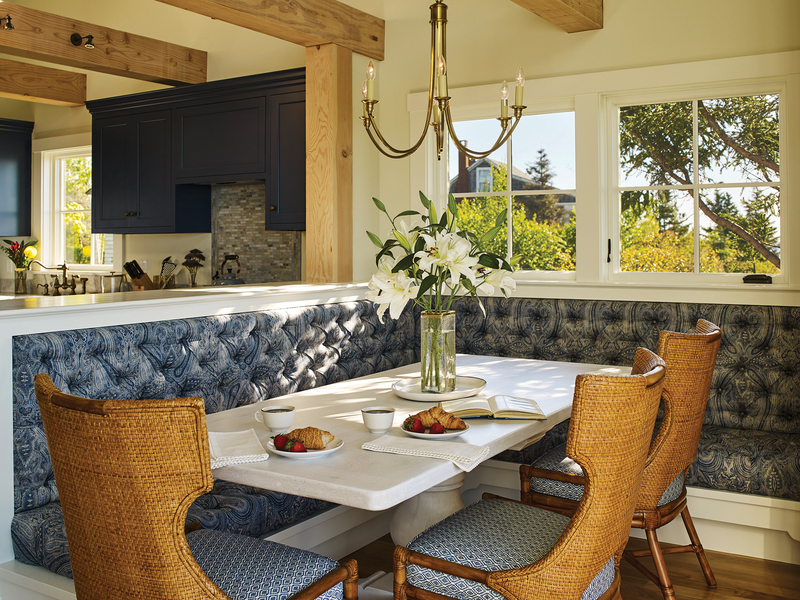 A custom banquette in the dining area is an efficient use of limited space and allows for ample seating. 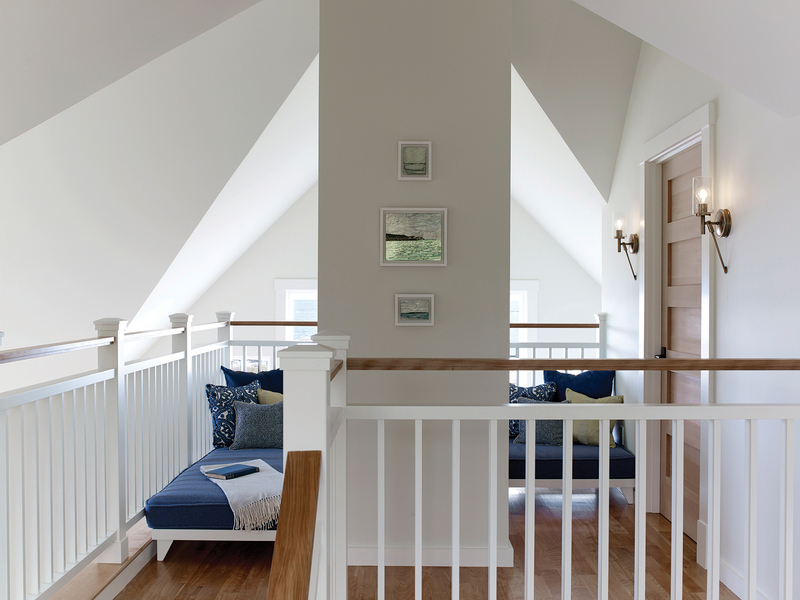 The quirky loft space at the top of the stairs is captured as a reading nook by incorporating two large, custom benches, which wrap the centralized chimney and offer some of the best views of the offshore lighthouse. 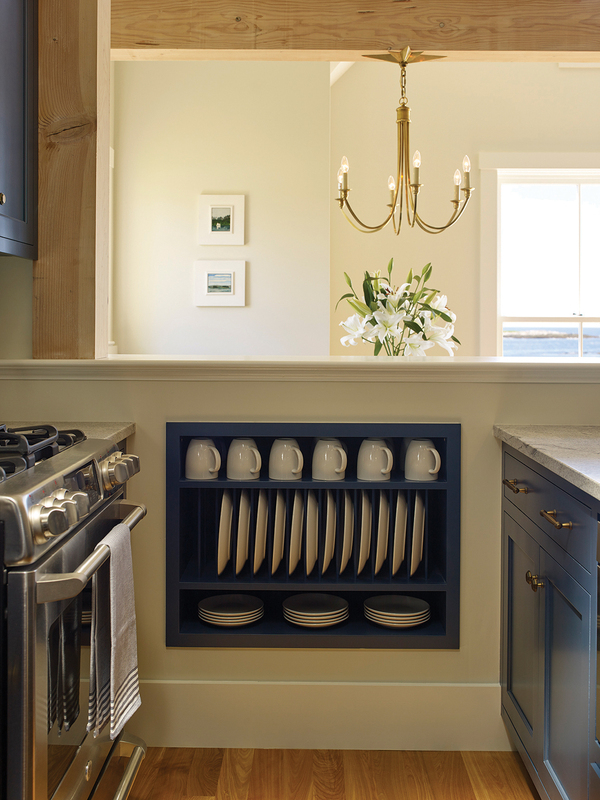 The plate rack in the kitchen, as well as the dresser in the second floor bedroom, are inset into the wall to provide added storage without stealing valuable floor space. Every inch of space was treated with significance, which allows for a rarity of a home that is thoughtfully designed and beautifully decorated. 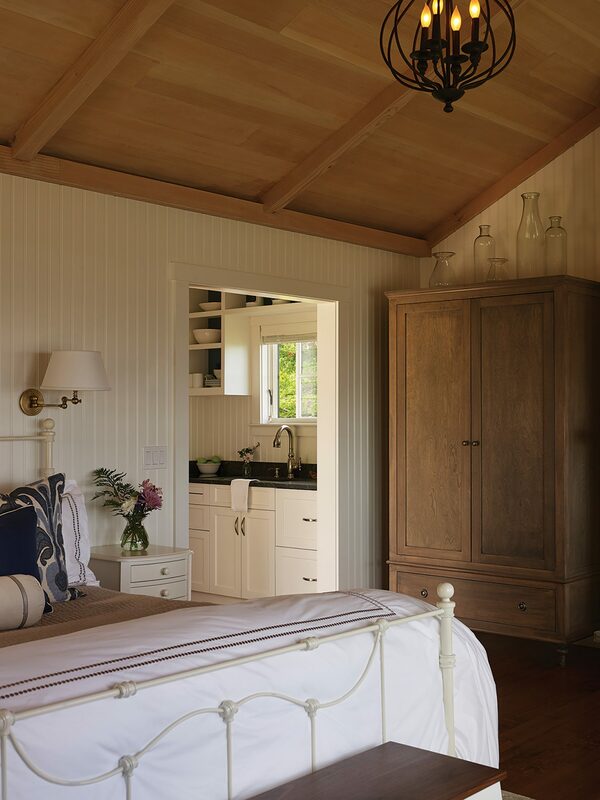 One of the most unique features of the house is a built-in bed with headboard in the first floor bedroom. 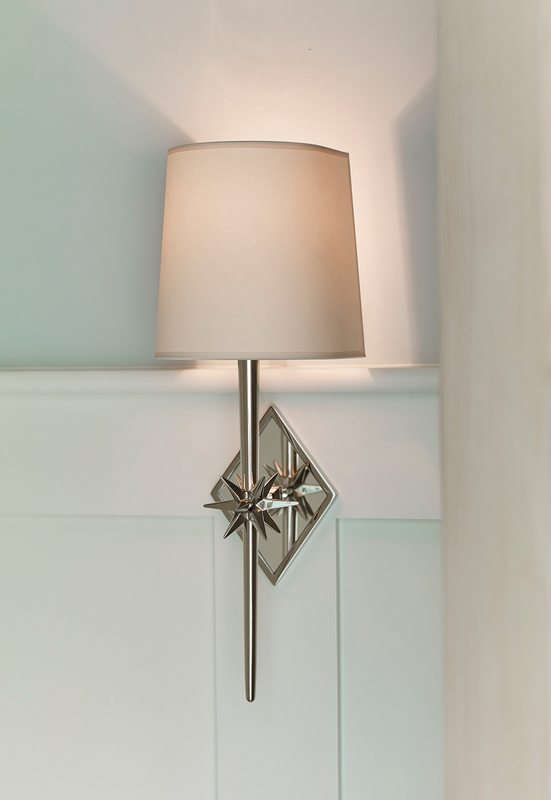 The integrated design element eliminates the need for separate side tables and lighting within the tight space. With windows lining both adjacent walls, the built-in further provides a semi-concealed area where the drapery can stack when open. 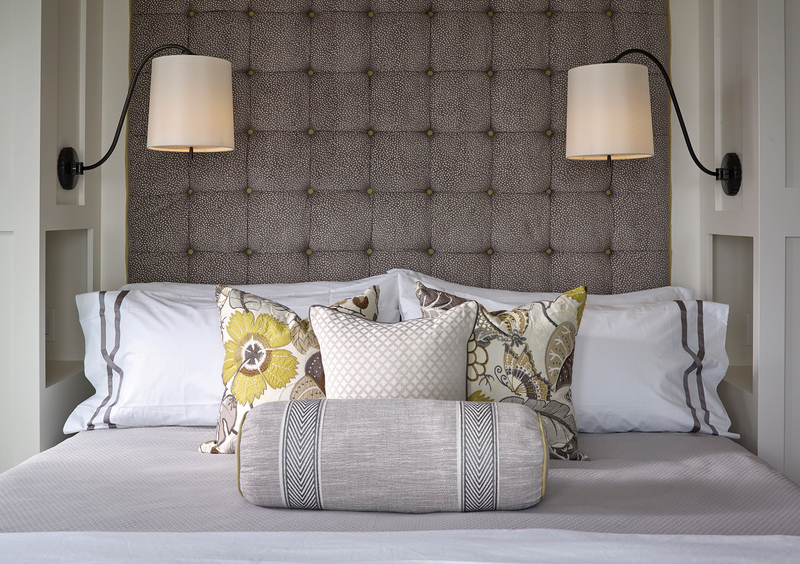 Pops of citron, paired with crisp whites and grays, make the space feel welcoming and bright. 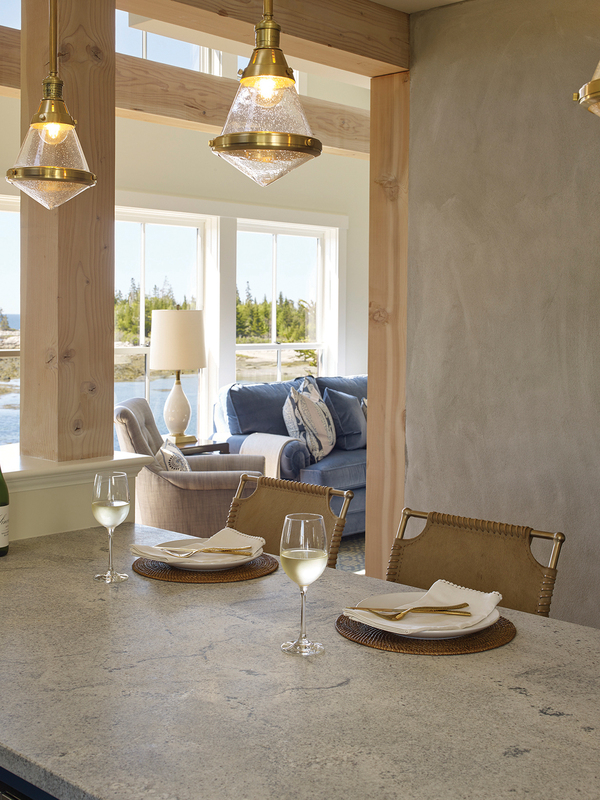 The design and placement of light fixtures was a particular challenge, given the desire to integrate as many windows as possible in the cottage to highlight the spectacular views of the ocean and flood the space with natural light. 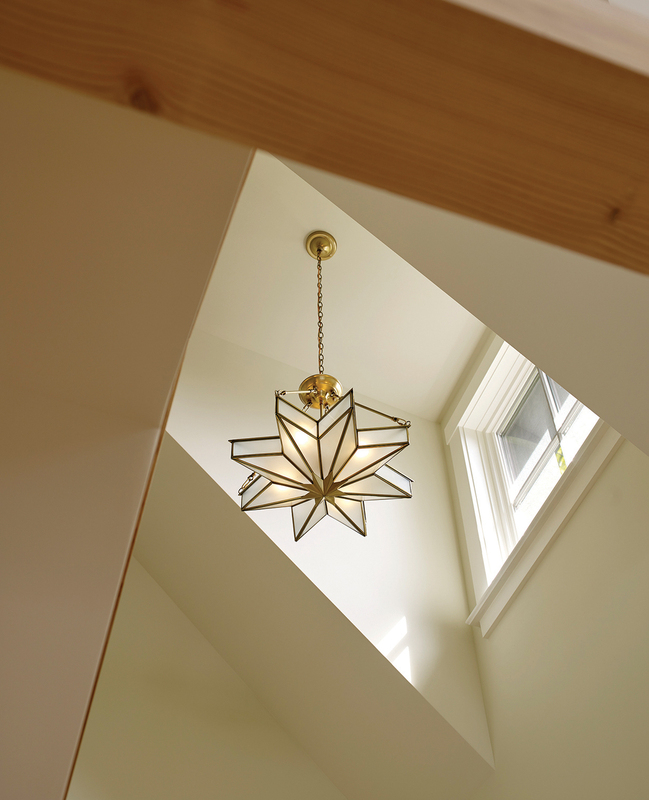 On the main level, overhead lighting is achieved by strategically placing lighting within the fir beams that traverse the spaces so the fixtures are unobtrusive but still provide needed light in the evenings. 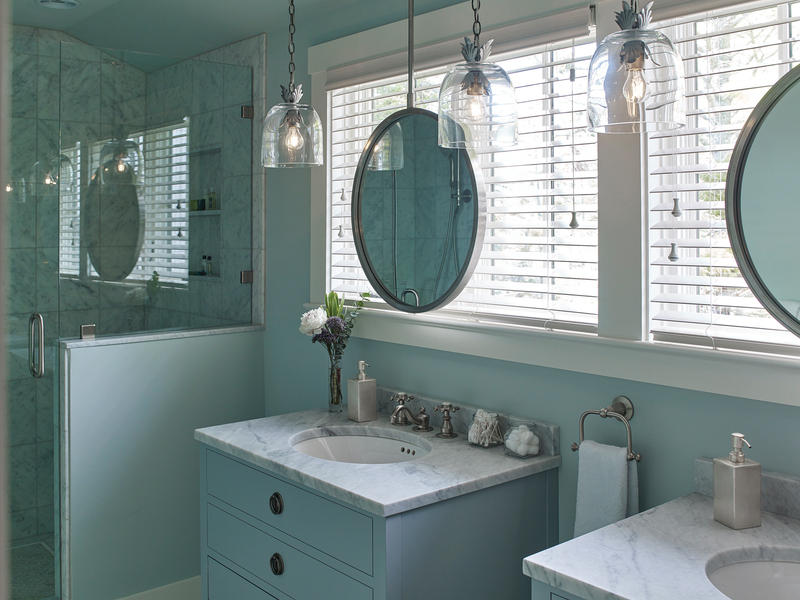 In the long and narrow second floor bathroom, windows are located directly in front of the vanities, creating a challenge in placing both mirrors and lights. By designing custom mirrors suspended from the ceiling with hanging pendants on either side, the issue was resolved in a clever and functional yet whimsical way. 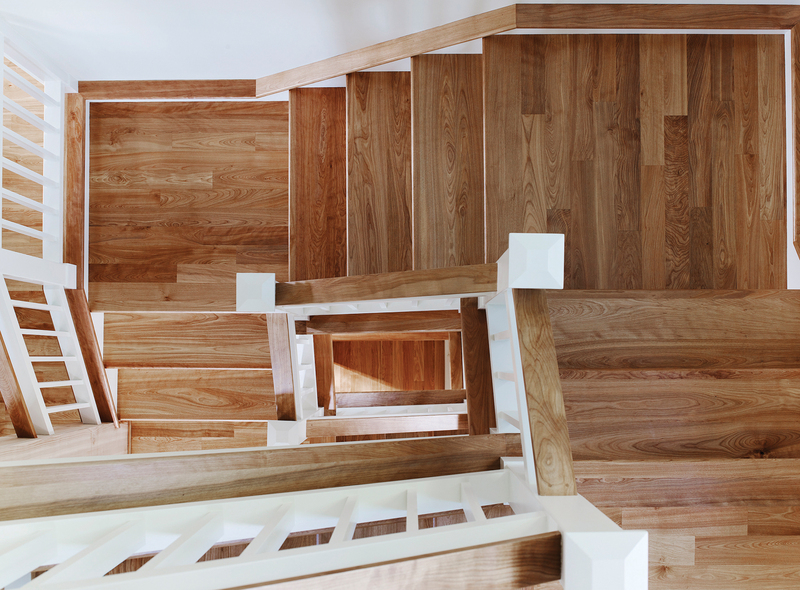 Another unique feature of the main house is the winding open stair, highlighted by a one-of-a-kind handrail and baluster system. 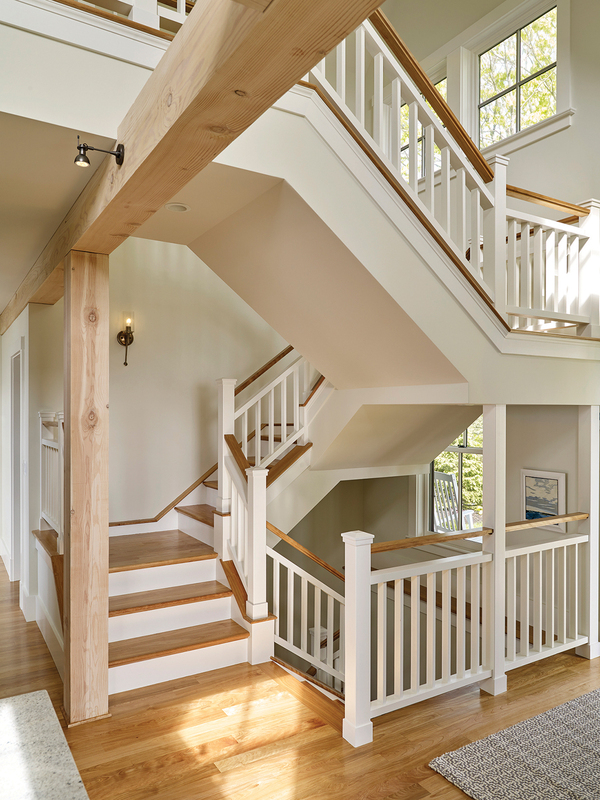 Supported by a fir post and beam on the main level, the red birch and contrasting white stairwell offers a visual connection between all three floors. It was a test in engineering and design because it needed to float within the space but not obstruct the large exterior windows that run the height of the home. 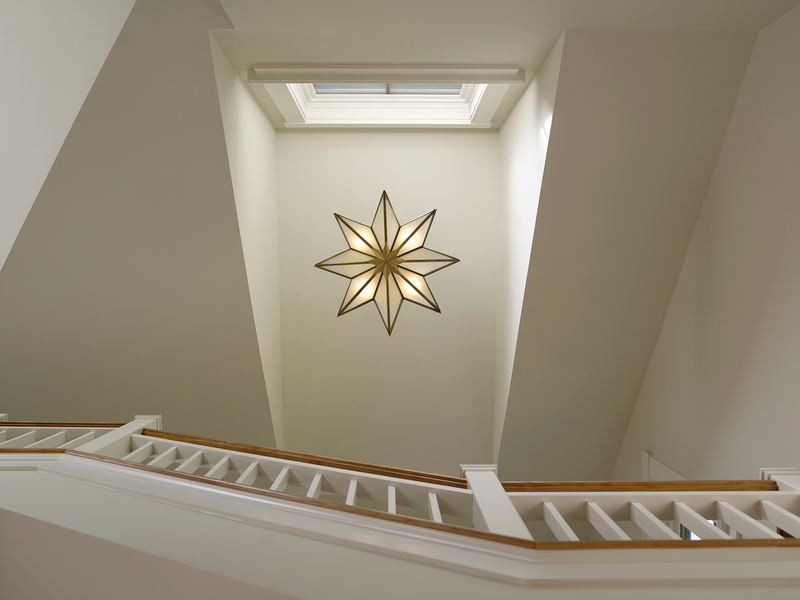 Additionally, the handrail and baluster system involved complicated connections, which made for a rewarding study in geometry! 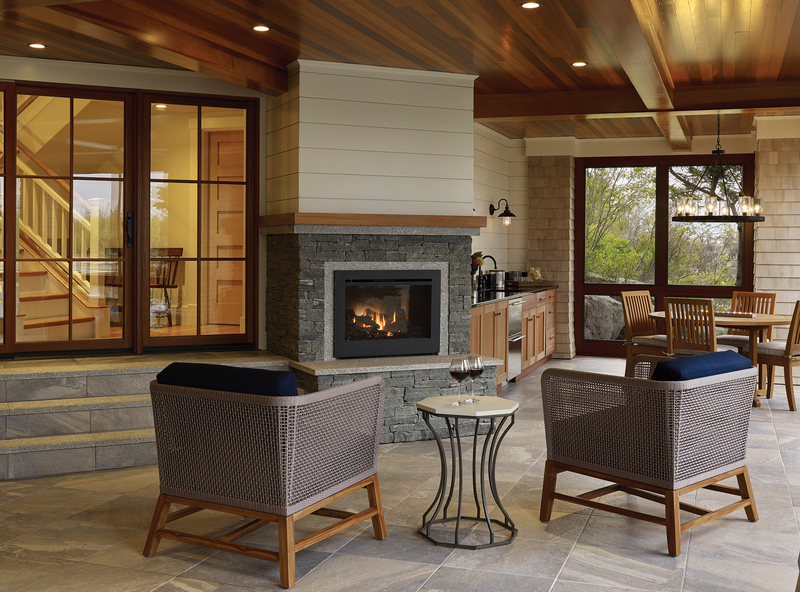 The lower level entertainment space, which in the previous cottage was a storage area with a dirt floor, is an elegant open-air room with a cedar coffered ceiling, porcelain tiled floors, a stone fireplace, teak cabinetry, and mahogany framed screen panels between shingle clad columns. 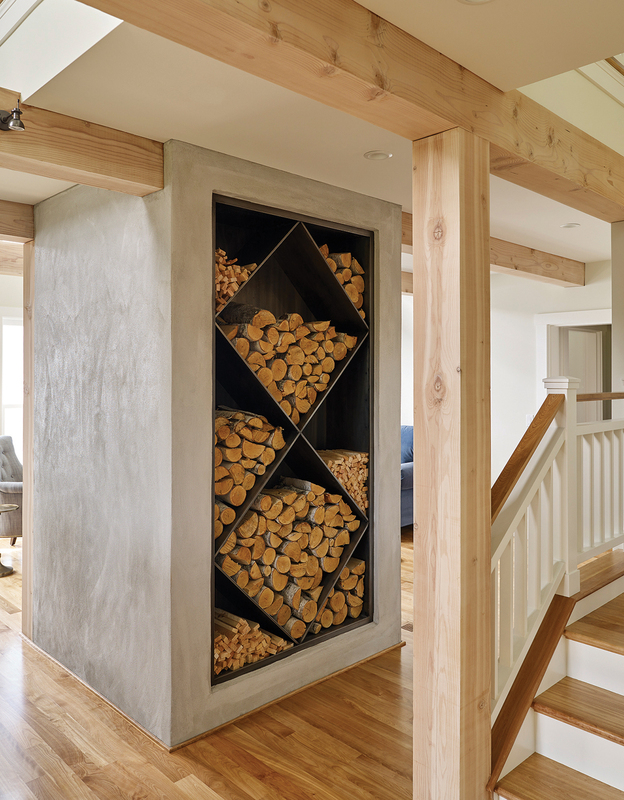 The materials were selected for warmth and aesthetic, as well as weather resistance (since storm surges will inevitably reach the home and flood the FEMA-compliant foundation below). In cooler months, custom plexiglass panels replace the screens and protect the space from the elements, while also allowing it to be utilized in multiple seasons. Perched on the edge of the coastline, careful attention was given to tree protection during construction, as the existing trees and their canopies help settle the buildings into the landscape. 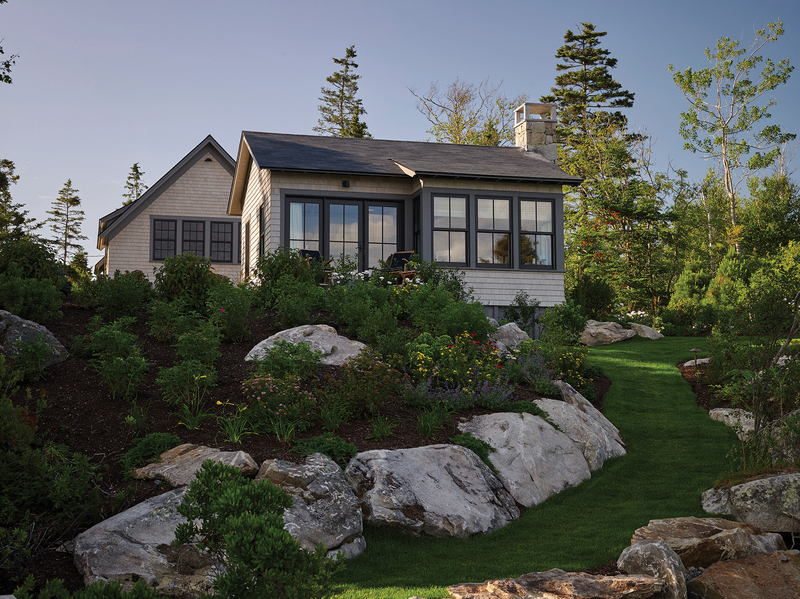 During the planning phase, the main house was sited as far south as possible, to maintain views from the barn and guest cottage and to allow room for a winding path to the shoreline. The pathway gradually declines through hardy native plants and rocky outcroppings and leads to the pier, used daily by the on-site sea captain to ferry guests and supplies to the island inn. 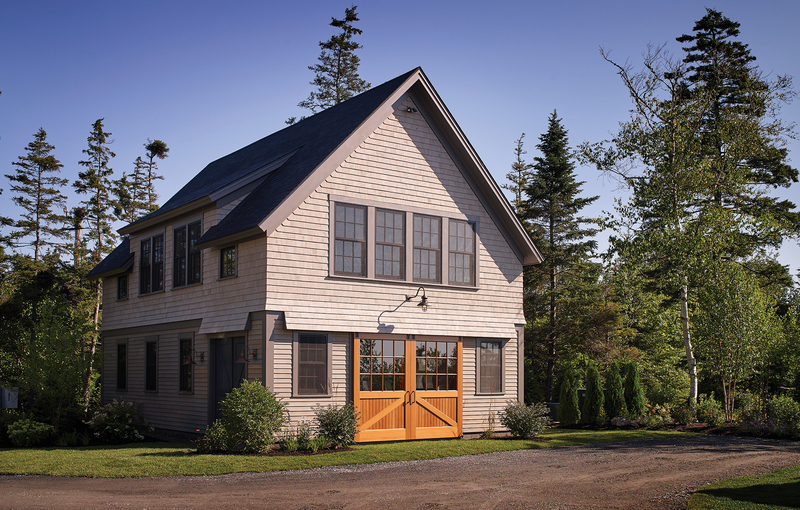 The barn at Town Landing embodies the traditional and ever classic nautical design of the region. 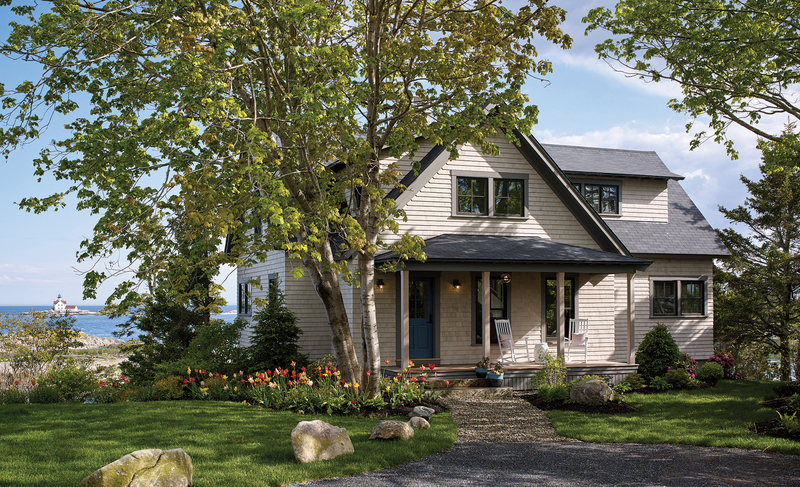 The design inspiration was drawn from the rich hues of blue and gold seen in the outdoor landscape, as well as other features characteristic of New England, such as horizontal siding and touches of cherry. 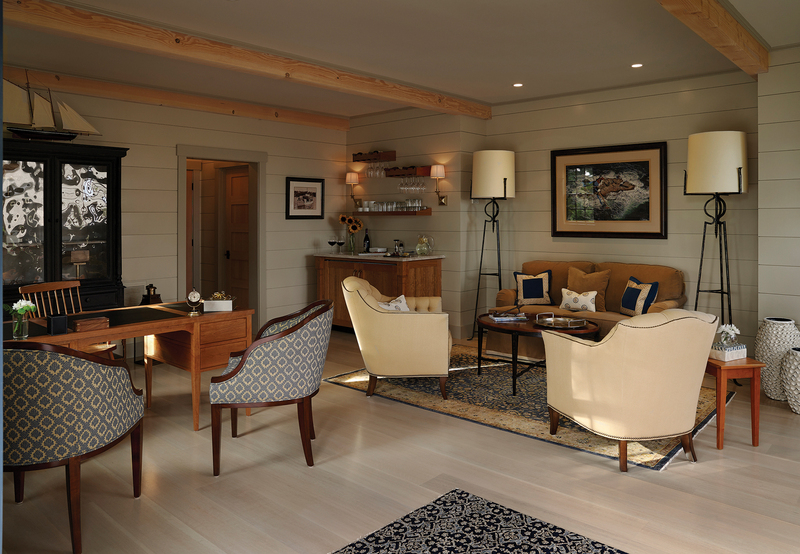 The use of the barn is more non-traditional: the structure serves as the office and lounge space for guests arriving at the property and awaiting boat transport to the Inn at Cuckolds Light. Our client required a functional desk and ample office space, but also wanted a place fit for gatherings and client entertaining. Designed to evoke an antique feel cultivated over time, the mixture of fine furnishings is juxtaposed against the rustic environment of a timber framed barn. The classic Thomas Moser desk, hand-crafted by Maine artisans, is covered in a traditional black leather top. Its deep color is accentuated by the seeded-glass front cabinet against the wall. 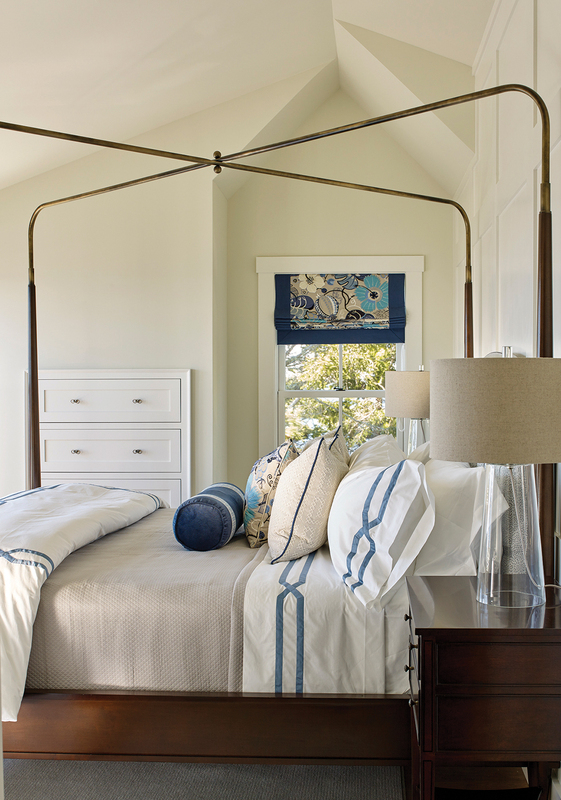 A model of a vintage sailing ship rests atop the cabinet, flanked by oars and aged brass ship’s lanterns. 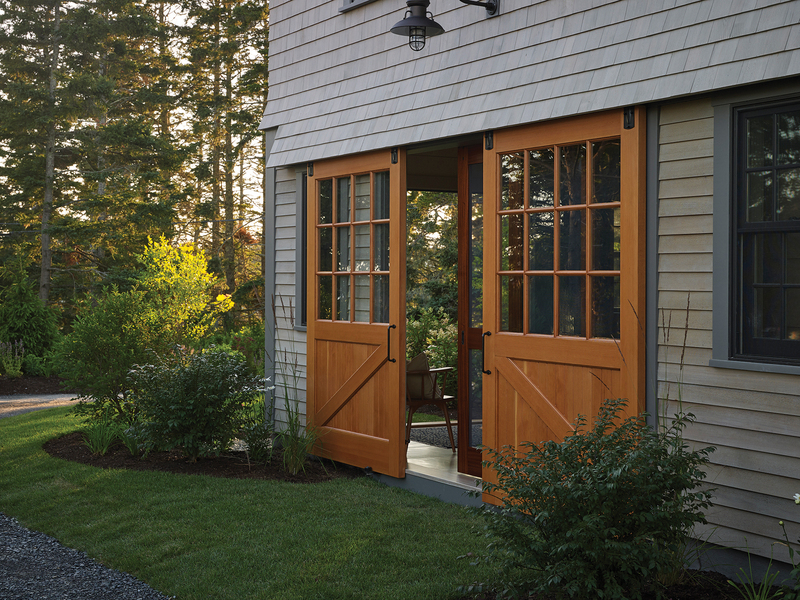 Due to the barn’s size constraints, it was especially important to take advantage of the grand views just beyond the building by incorporating large windows and a unique multi-layer barn door system. 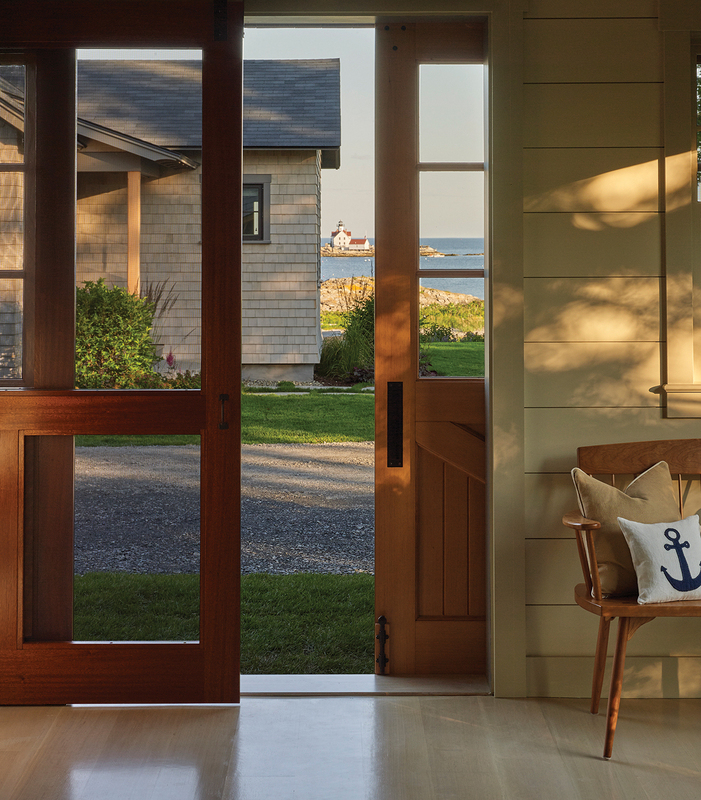 These doors face the ocean and flood natural light into the space, therefore reducing the amount of secondary light needed. The end result is a bright, yet bold, multi-use structure where both work and play exist harmoniously. 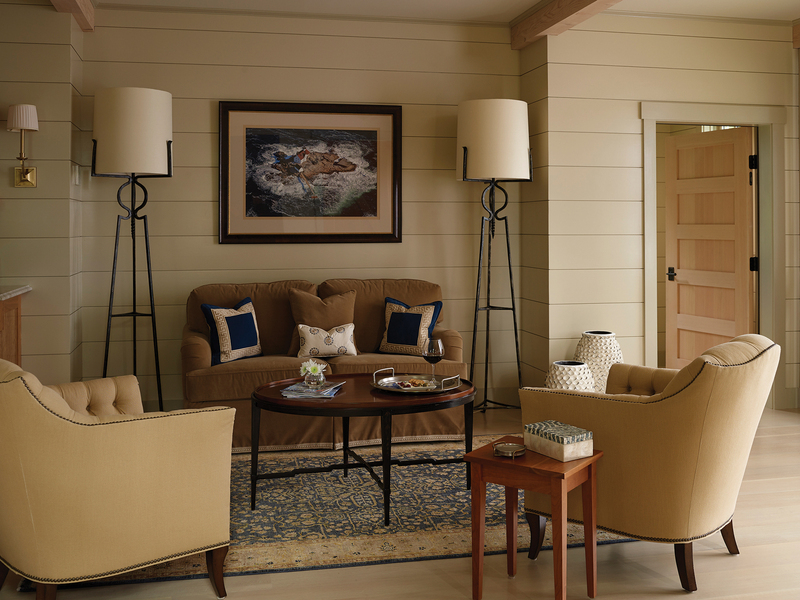 In the seating area, the main furniture grouping is defined by a beautiful blue Sarouk rug, tole and wood coffee table, along with a pair of champagne-toned tufted chairs. A plush velvet loveseat is offset by pickled fir beams above and anchored by oversized iron floor lamps on either side. Vintage photographs and maps of the area are displayed in rich wood toned frames with brass accents. 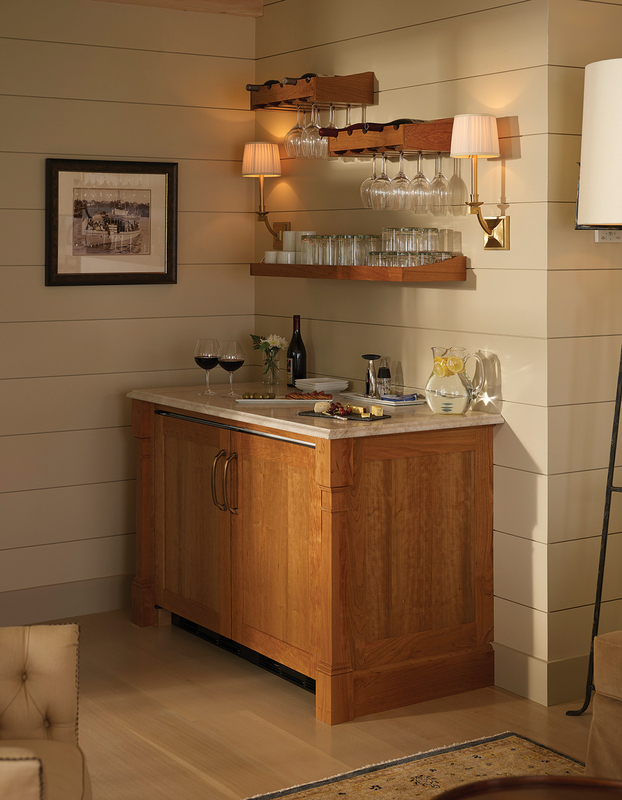 A cherry and quartzite dry bar with custom-designed wine and glass rack sits adjacent to the seating arrangement. Tucked away in the corner, the bar’s location allows for easy access, but also does not intrude on the space’s primary function. 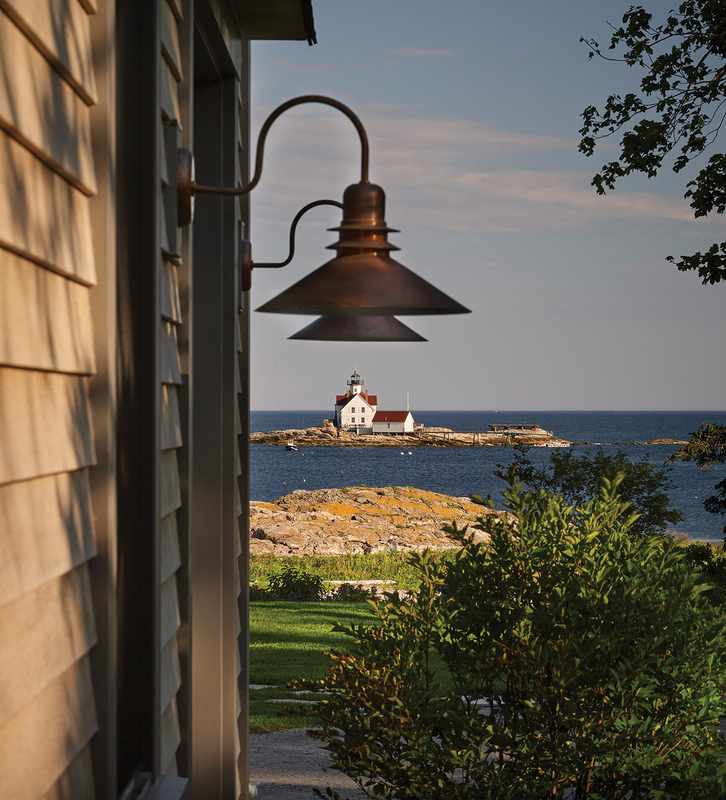 Adjacent to the main house and barn at Town Landing, the guest cottage sits on top of a natural ledge at the southern edge with expansive views to the ocean and the lighthouse beyond. 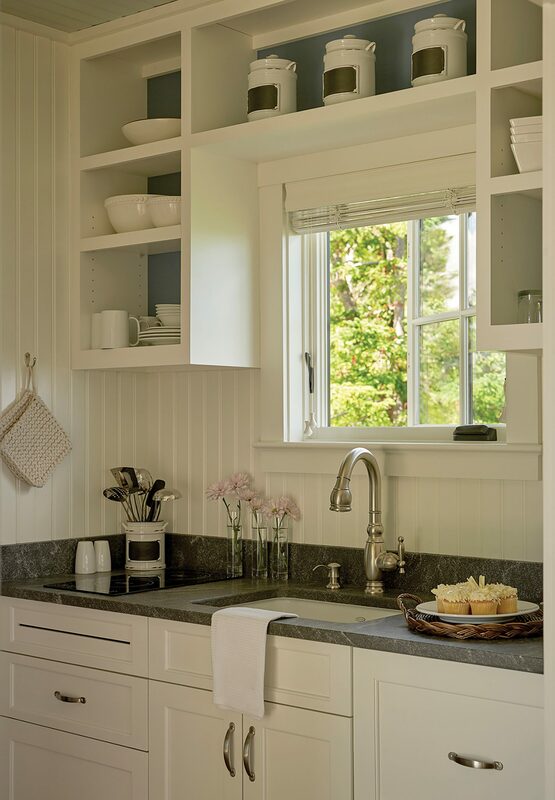 Once again, the small footprint of the cottage necessitated a layout as open and airy as possible, accentuated by numerous windows with large panes to allow light to flood in. 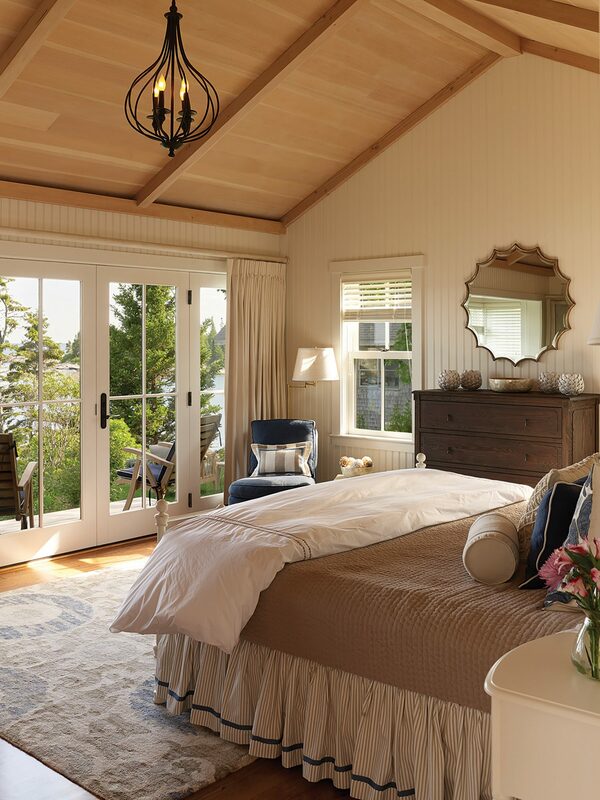 The architecture is traditional; the cottage design is in keeping with the early 1900s vernacular of nearby homes. .
A small porch with two chairs is accessed through french doors in the great room, allowing a peaceful place to rest while taking in the spectacular ocean panorama. 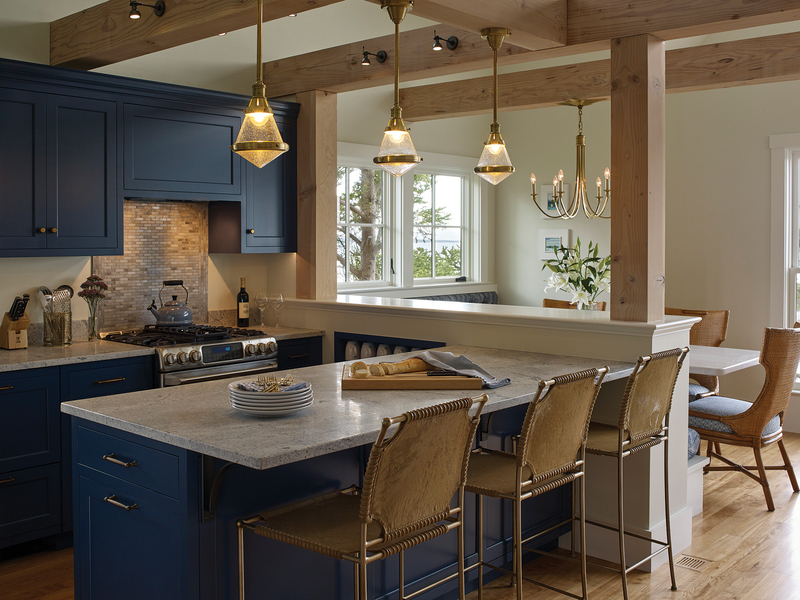 The great room palette is composed of the deep blues of the ocean, light beige hues of the sand, and rich tones of the soil and surrounding rock. 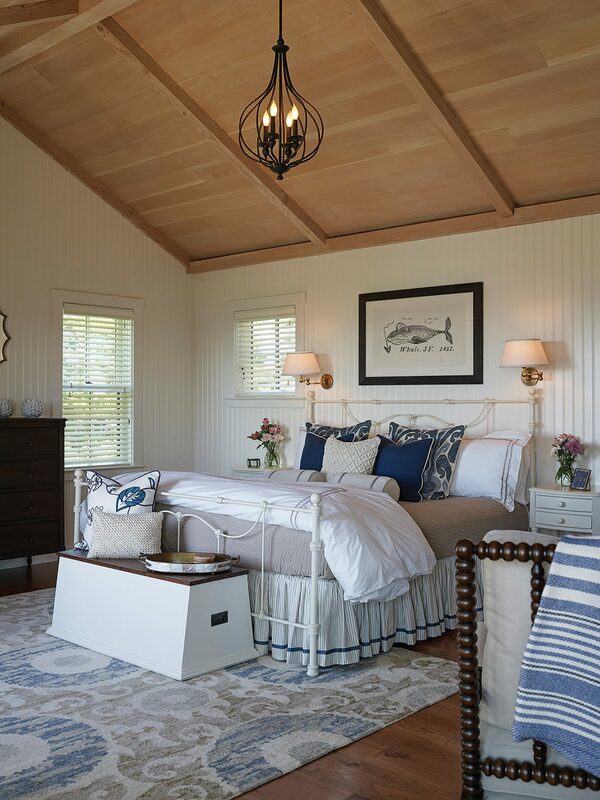 Beadboard walls, accompanied by a white-washed fir ceiling and antiqued pine floors, give the cottage a traditional feel; the visual contrast between these elements also creates depth, accentuated by the cove lighting at the base of the ceiling. 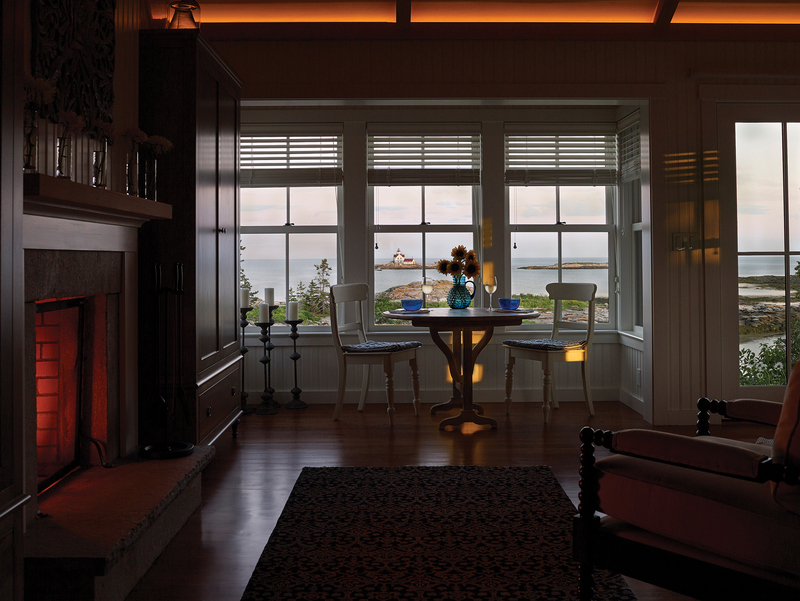 The dining area also capitalizes on the view, sitting within an alcove wrapped in windows. 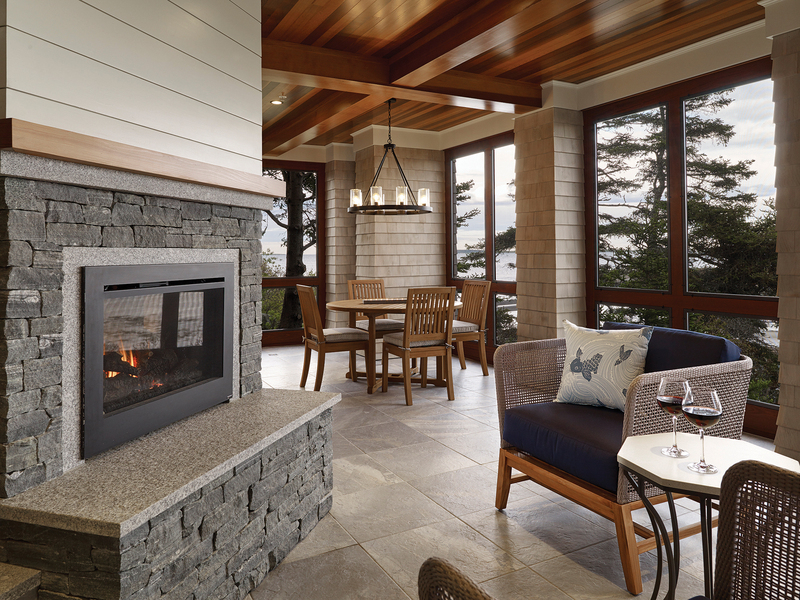 The fireplace is faced with granite and anchored by a rough-hewn granite hearth. 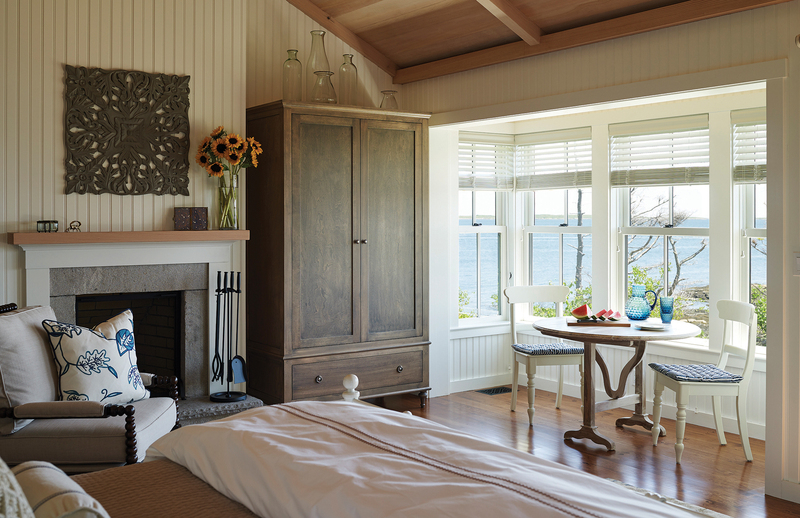 Due to the small floor plan, every piece of furniture selected for the cottage was carefully considered to serve multiple purposes. On each side of the fireplace, two custom armoires house the TV and provide additional closet space. 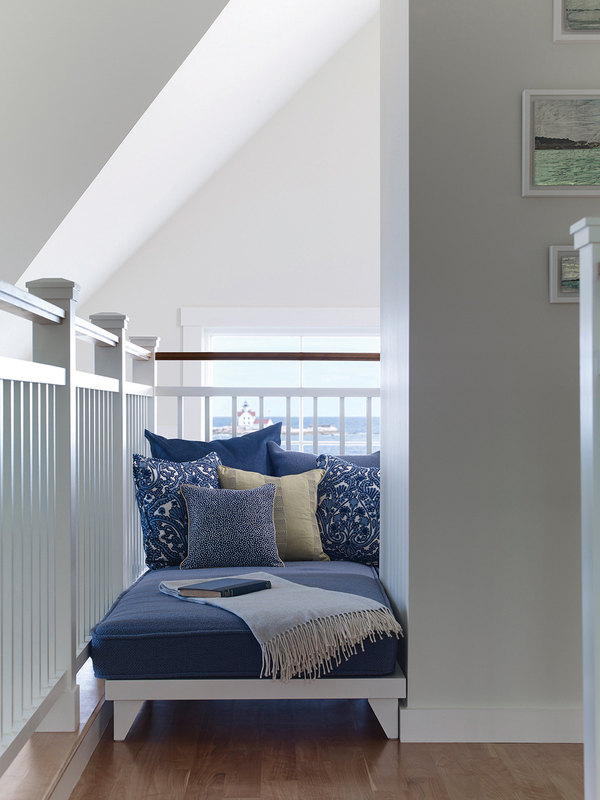 A custom trunk, by local Maine craftsmen at Salt Furniture Company, rests at the base of the bed to provide added storage. In the kitchen, refrigerator drawers offer plentiful storage within the compact area, while a small induction cooktop minimally consumes the countertop and allows for as much cabinet space as possible. Deep blue walls behind the open shelving create a visual pop against the crisp whites. 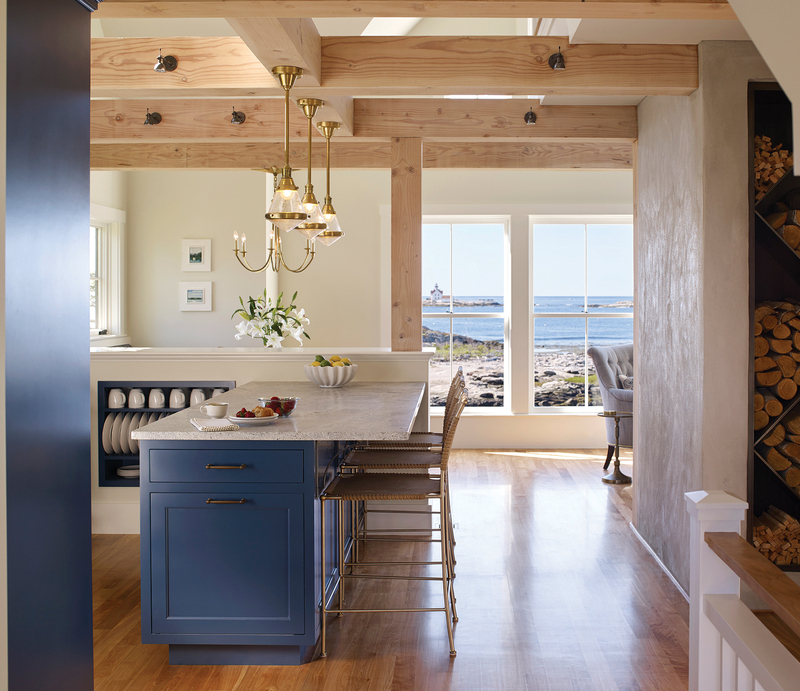 Another quaint and memorable element of the kitchen is the beadboard ceiling, painted in a soft blue—a nod to a popular Maine cottage feature of days past. 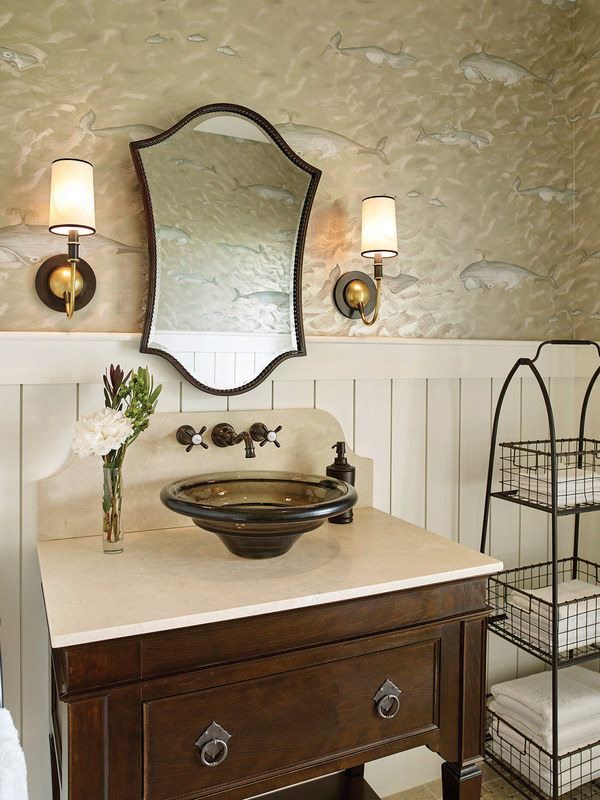 Just beyond the kitchen, the bathroom is finished in a monochromatic color palette composed entirely of soft neutrals. 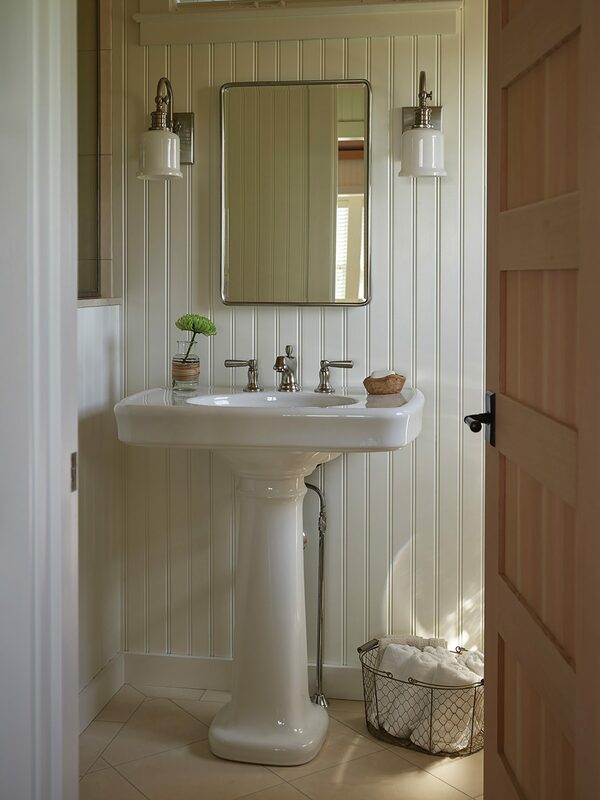 Beadboard and fir elements continue in this room as cladding on the walls and ceiling. The bathroom floor and shower are tiled in honed limestone tiles with crushed glass accents. 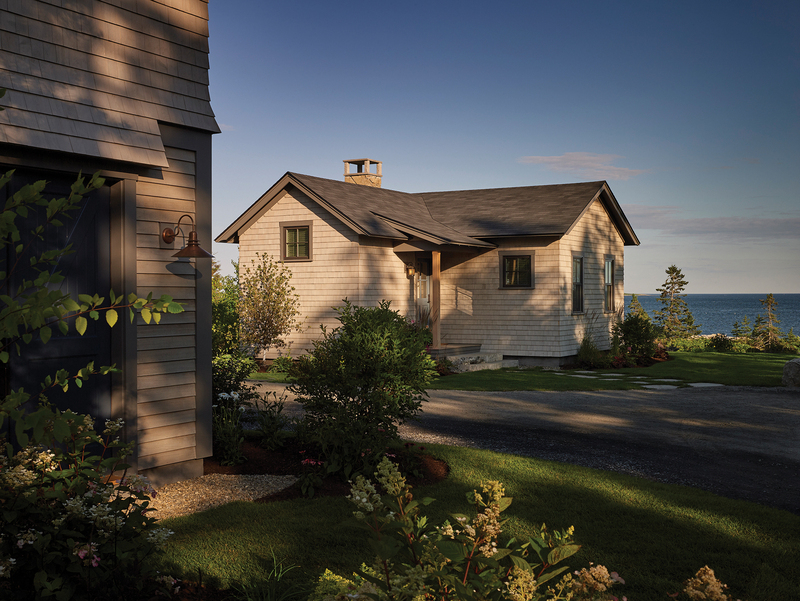 While each building at Town Landing is unique, there is an overarching architectural vision, drawing from traditional, shingle style aesthetic and utilizing signature detailing and colors to unify the structures. From the outside, touches of fir and red birch woods, details of antique brass, and a palette deep in blues bind the buildings together. 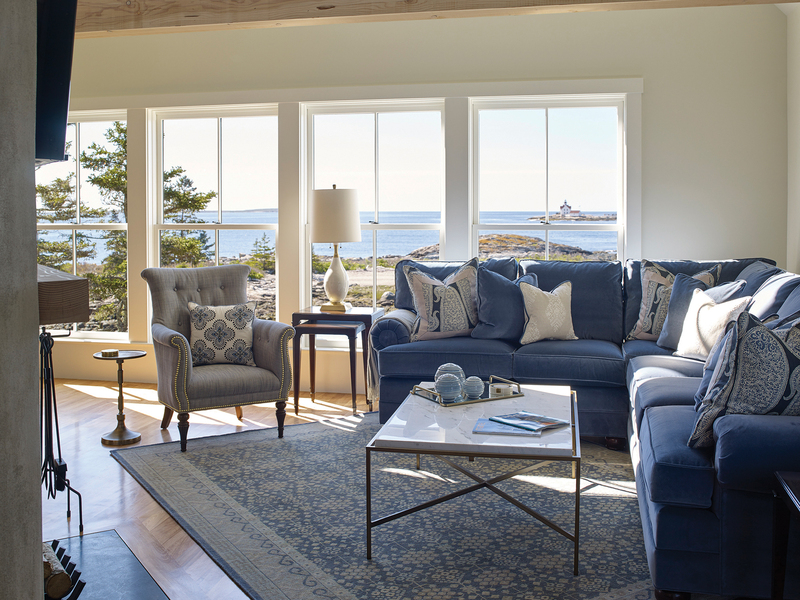 From the inside, each space is centered on the spectacular ocean and lighthouse views that complement the finish palette and embody the spirit of the quintessential Maine retreat.